Restylane Refyne® and Defyne® NEW! Holiday hours: We will be closing on Monday, December 24th (Christmas Eve) at 1:00 pm. We will be back in the office on Wednesday, December 26, 2018. Ultra Smooth Skin has the services you want! Ultra Smooth Skin offers a complete listing of medspa services focused on your face and body. Want Botox? We've got that and a lot more! We offer an extensive menu and FREE consultations. Professional. Exclusive. Private. That's who we are. By the way, you don't have to be a member of The Village Health Club to get services from Ultra Smooth Skin! Just come on in, ask for our office, and you'll be good to go! Plasma Pen has quickly become the world's most sought after, non-invasive, nonsurgical, plasma skin-tightening and rejuvenation treatment. This German manufactured and CE Certified device can be used to treat: Upper and Lower Eyelids, Nasolabial Folds, Jowls/Jawline, Stretch Marks, Crow’s Feet, Tear Troughs, Ear Lobes, Neck Lines, Scars, Loose Skin, Non-Surgical Facelifts, Forehead Lines, and Overall Resurfacing/Rejuvenation. "Lisa Williams is a nurse practitioner who has been providing cosmetic dermatology procedures for 14 years and is constantly training and researching non-invasive procedures..."
Order your favorite SkinMedica products at our online store! Ultra Smooth Skin has earned a "Black Diamond" certification from Allergan, the manufacturer of Botox. The Black Diamond is awarded to leaders in the medical aesthetics field who demonstrate a commitment to the highest level of patient care according to Allergan standards — which we do. Less than 1% of all medical aesthetic practices ever reach this status; so, yeah, it's a pretty big deal — and we're very proud to provide this level of stellar service for you. More than a workout, it's a time out — an oasis where you can relax your mind, catch a winning smile, and experience a whole new level of healthy living! Take a virtual tour. April's special: New Village members will receive May dues FREE + a $500 New Member Gift Package. Exclusive USS discount: Anybody that mentions they were referred to The Village by Ultra Smooth Skin will get $150 OFF enrollment! *When you enroll, we offer two types of memberships: one where you belong to a specific location, and another we call "Choice". If you plan on visiting the same location all the time, you'll pay the "Mo. Dues" column rate. If you want access to any of our clubs/locations, choose "Choice" when you enroll. 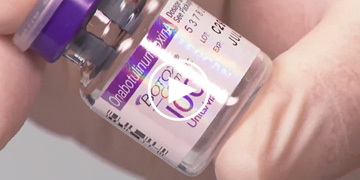 Watch a quick video (22 seconds) at Allergan's site so you'll know if you're getting genuine Botox7 (you'll need to scroll down the page just a bit to find the video). 1Individual results may vary. 2All manufacturer claims, in regards to the benefits, process, length/effectiveness of treatments, how soon you'll see results or heal, or claims of minimal side effects such as minor redness or mild discomfort or no downtime, are provided by the pharmaceautical manufacturers as part of their guidelines in promoting their product and are backed by case studies/peer-reviewed publications and are published on their individual websites. 3Testimonials are the opinions of real clients that wanted to provide them and express their opinion to others. When written, the only editing done was to fix minor grammatical/syntax errors and/or to truncate extended testimonials that, while nice, went a bit long. Video testimonials are unedited. 4Treatments and services that are time-related (such as fees per a "20 minute session") are rooted in the fact that most appointments (i.e. the historical average amount of time required to complete most areas we treat) take that amount of time; however, it may be recommended or advised or necessary that more than one session time is required to achieve whatever affect you're looking for (such as someone wanting to treat many areas of their body vs someone simply wanting to treat their hands). A quick consultation in our office will provide you the exact time required to treat whatever you wish since treatment areas have a direct impact on time required to treat such areas. 5Superlatives, when describing services/products, are manufacturer claims and, in the end, it's your opinion as to what service/product is right/effective/best for you. 6Internal comparison claims comparing one technology to another (such as stating that a new product is x% better than the previous model, similar to how a 2019 model vehicle has many advances/improvements over a 2010 vehicle), when comparisons are done within the same company's lineup, are the manufacturer's statement-of-fact and reflect the latest science and/or breakthrough that, when released as a product, is the best/most effective at the time within their own product lineup — they are not claims comparing their product against other manufacturers' products. 7Videos, which we have chosen to add links to on our website, are either local television coverage pieces or third-party videos that we feel are great for learning and gaining an overview of the process of several services we offer; but third-party videos (e.g. those in the public domain, such as YouTube) in no way should be construed as an endorsement of Ultra Smooth Skin and/or our services specifically. They are meant as an awareness tool to help you decide upon common treatments provided by Ultra Smooth Skin and medspa providers nationwide. Some videos are produced by the pharmceutical manufacturers and others are by service providers, while still others are television appearances by Lisa Williams, the owner of Ultra Smooth Skin. 8Time is accurate as certain procedures have a fixed-length time of treatment per area. 9At our locations. 10Data on file at manufacturer. Copyright © 2005–2019 Ultra Smooth Skin, Inc. Copyright © 2005–2019 Ultra Smooth Skin, Inc. All rights reserved.